4 active loudspeakers, 4 (iPad) screens. 4 video/sound tracks. Durations; 04:55 min., 06:04 min., 06:22 min., 05:10 min. Play a single key and listen to the sound it produces. Play another key or maybe the same one and listen to the sound it produces. Play maybe more keys simultaneously or in succession. When a structure appears then stop playing. Restart with a single key and listen to the sound it produces. The piano was placed in a dark space. The performer played the piano with one hand and records the action with a mobile device with flash light in the other hand. 4 Recordings where made over the course of 2 days; 2 recordings with the left hand playing and 2 recordings with the right hand playing piano. 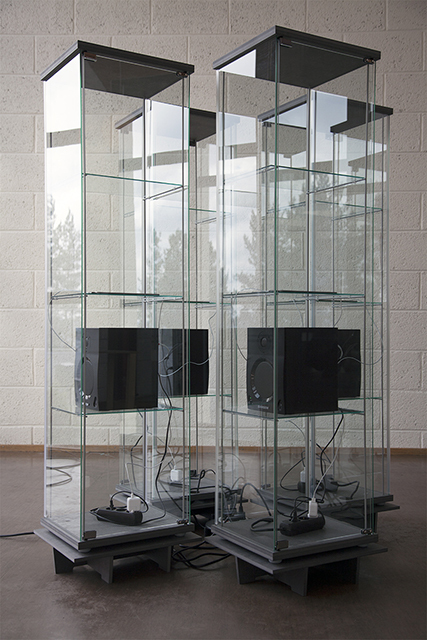 These recordings where placed in 4 glass cabinets where they played in a loop. The difference in duration between the 4 tracks produces an ongoing change in the coming together of the same sounds. EXHIBITIONS: Group. Kulturhuset, Oslo, Sept 2015. Title; Wunderkammer. Formulated by Heloisa Amaral within the framework of Ultima Academy which was part of Ultima Festifal. Curator; Helga Marie Nordby.